9 Event Marketing Nightmares and How to Solve Them! October may be the month of ghosts, goblins, haunted houses, and high blood sugar, but for those in the event management world we know that there are far more terrifying things out there. In the world of event marketing there are things that can leave event attendees feeling dreadfully overwhelmed. Things that can render presenters woefully unprepared. Things that can only be called (*lightning strikes in the background*) event marketing nightmares! As scary as they might seem, event marketing nightmares are just event marketing hurdles writ large. 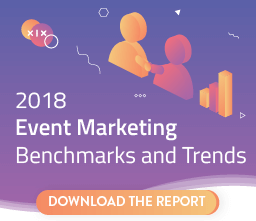 They are challenges to success that all event marketers face at some point or another and, like all challenges, they can be solved. We asked leading event marketers about some of their biggest challenges and how they've learned to solve them. We also included some challenges that we've heard about over and over again. Grab your flashlight and steel your courage—it's time to conquer your event marketing fears! If there’s one nightmare that keeps event planners, marketers, and managers waking up in the middle of the night, it’s this. You’ve spent a lot of money on getting people to come to your event. You’ve booked some A-list talent to speak. And you’ve managed to land a fantastic venue that’s perfect for your event. Finally, the day of the event arrives. To your horror, you find that your conference hall is completely empty. Solution: Optimize your marketing efforts and double down on audience retention. Make sure that your event is clearly advertised on all of your social media profiles, blog, and website. This means also shelling out for paid ads where appropriate. Empower those who have already committed attendance (especially speakers!) to be event ambassadors by encouraging them to share the event on their own social media profiles and websites. Create an RSVP to keep attendees accountable. "With 14 concurrent tracks at Content Marketing World, we try to make sure that each track, and each speaker in that track will draw roughly the same number of attendees, so each track can stay in the same room all day. This is necessary so some sessions don’t fill too early, and so some rooms don’t seem empty with only a small (albeit interested) number of attendees." Solution: "Our event team works hard on capacity planning by researching the interests of the attendees, historical data on that speaker, and trends on a particular topic to determine which room size would be best. In addition, we also have our attendees select their sessions within our mobile app as early as 90 days prior to the event. We can watch session selection, when sessions get close to filling up, and sizes of waiting lists to make some educated decisions on switching rooms. This allows us to keep both attendees and speakers happy with the room setting, before we have our program guides and signage printed." Same setup as nightmare #1, but instead of the conference hall being completely empty, it’s full of disengaged, uninterested attendees. Solution: There are a number of ways to engage attendees before events and during them. Before an event, crowdsource questions for interviews and round tables, create hangouts or webinars related to event sessions, and send segmented emails out based on registration data to get specific attendees pumped up for specific aspects of the event. 4) Data in the Dark! "Historically, the lack of real-time data about how the meeting is going has been a real challenge. Paper surveys were handed out, but, by the time things were tallied, the event was over. Planners have been flying blind, unable to make meaningful course corrections based on empirical data." Solution: "There are now great opportunities to track the attendee journey to provide better customer service on an individual and collective basis. Every touch can be trackable on a mobile event app. There are mobile polls and surveys that instantly collate the results. Beacons can measure crowd movement and dwell time in exhibit booths. Social sentiment analytics tools can get direct, immediate feedback. My advice is to seek out technology providers that focus on analytics and use these data to improve the current and future events." Congratulations. You’ve managed to stage an awesome event. However, there’s one big problem–there’s almost no trace of your event on social media. Solution: Devise a comprehensive social media strategy. A successful event is not only memorable; it fosters a community that outlives the event itself. There’s no better way to do that than with social media. Figure out what social media platforms you want to use, and how you’ll use them. Consider making use of Snapchat Geofilters and Twitter Chats. Encourage attendees to make regular posts to social medial. If you need some inspiration, check out how these three events used social media to excel. "We were organizing startup-investor speed-dating for a large event of 1000+ companies. With one week to go we got requests from most attending VCs to meet specific companies at the event. We had focused on using our database to match investors with startups so this added a layer of complexity to the process which could result in phantom meetings and a scary trick-or-treat experience for both sides!" Solution: "Get feedback from attendees well in advance to understand exactly what they want from the event. Don't assume they will give you this information well in advance, most attendees only really start thinking about their conference experience with a couple of weeks to go. When attendees register, immediately ask them what their dream experience would be like, and customize your event based on what's achievable at scale." You’ve worked so hard to secure your keynote speaker. You’ve spoken with her several times over the phone. You’ve outlined your event and the expectations for it. You’ve made sure that she arrives at the hotel safely the night before the event and that she is greeted the morning of her big presentation. She checks out the conference and is wowed by the stellar job that you’ve done in planning the event. You’re wowed to have her present. Then, a few minutes before the event, you can’t find your presenter anywhere. Gasp! Solution: Give your presenter a designated space to decompress before a presentation. That way, they can make sure they’re where they need to be mentally and you can make sure where they are physically. "There are times when an event is coming up very fast but there are still a lot of pieces that haven't been put together and check boxes that haven't been checked. We recently held an event where a week before, one of the main vendors had to back out, the content still needed to be developed, and there were some disagreements about the flow of the agenda. Adrenaline-pumpingly spooky, if you ask me. Solution: "While not everything will always be sunshine and rainbows, if you're level-headed about your approach, things tend to fall in place. Instead of looking at your upcoming event as a mountain of checklists, look at the big picture of your event - goals, themes, assets- and start from there before focusing on the nitty gritty. What can you do without, what is a necessity and what can be outsourced or delegated? When you think of an event as a flow with a story you want to tell and a message you want to get across to your attendees, it can help you understand and pinpoint the value of each piece of the puzzle instead of sweating the small stuff." Your attendees just want to get into the event, but they’ve been waiting for what feels like hours in a registration line. Solution: Try to get an estimate of when the peak hours and dead hours of your event will be and plan for both. To cover all of your bases, add a designated floater to your event staff to serve as an available resource for attendees. There are so many spooky ways that an event can go wrong. But let’s not forget that there are so many ways that an event can go right! The next time you plan on having your event, you can always hedge your bets by using the right event management software or—at the very least—by following Benjamin Franklin’s famous words. What are your event planning nightmares? How have you solved them or prevented them from happening? Let us know below! Discover how Traffic and Conversion Summit scaled to 6000+ attendees by programming personalized content that speaks to the interests of attendees in this webinar recap. Each month we interview an events professional who is breaking the mold. This month we spoke with Maddie Vesey—the events lead at InsightSquared—about scaling a company conference, launching an event.. Your event campaigns are about to get a lot more precise. See how marketing leaders from InsightSquared and Bizzabo fit events into their account-based marketing (ABM) strategy.